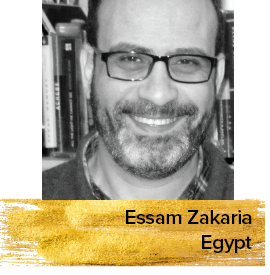 Essam Zakaria is an Egyptian film critic, journalist and researcher who has written for several Arabic publications and is the author of ten books about Egyptian and foreign cinema. He has served as a jury member in many local and international film festivals. Career highlights include being editor-in-chief of Nazra magazine, instructor at the film department of the American University in Cairo and lecturer on film at SEMAT Film School and Emad Eddin Studio Film Workshop.